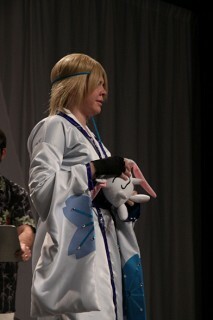 This was the year I was participating in the cosplay contest by myself. Because of that I wanted to do something that not only was difficult, but was a dream come true. Thus, I chose CLAMP to be my inspiration. Going through all of Clamp's stuff, I wanted to do something that was beautiful and pleasing to the eye but at the same time so complicated that people would be astonished. And thanks to my loving friends for being models, this group came up. It's taken me all summer to make these cosplay. These were a display of the best of my abilities and that anything that happens judging and competition wise, or simply the acceptance of the group, I am utterly and 100% happy. A ton of work went into making all five cosplays. I’ll break them down by character. 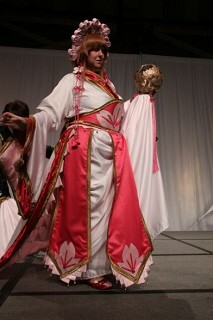 Sakura Hime - Sakura was made in six parts: the skirt, the train, the obi, the blouse, the headdress, and the ball. The headdress base is a simple brown headband. There are 14 sakura on the headdress, 7 on each face. Each Sakura is made up of 5 pieces of pink satin ribbon, folded and glued to make a petal. Once all 5 petals were attached, pink glass beads were attached to pieces of jewelry wire and then attached in the middle by a rhinestone. The ropes on the sides are tapestry trim, glued and tied and sealed with rhinestones to make sure nothing comes undone. Matching pink tassels were added to the bottom. The gold beads were spray painted a matte gold to match the trim. The skirt started off as 5 yards of pink crepe and white satin pleated at the top to give that circle skirt look. After that, I made the panels. I cut the shape out, ironed on the sakura with heat n’ bond, and added the trim. The bell trim consists of a piece of ribbon sewed in a triangle and ironed, then the bell and bead stitched at the end. I made approximately 100 of these bell triangles, however only used about 80. Once the panels were sewn onto the double skirt, I added a brocade tummy band and installed the zipper. The train started off as 2 yards of satin, sewing on a brocade and cloth trim around the edge. I used pink crepe for the lining and then added the bell trim around the edge. Using the brocade for the top, I used hook and eyes to attach it to the skirt. The obi wraps around and connects on the side with a hook and eye. I started off with a brocade base, then adding a fuchsia crepe with interfacing. Trimmed with the bell trim around the edge, I added a bow to the back made of brocade and trim. The sakura in the middle, as with all sakura on the outfit, was accented with fuchsia ribbon and rhinestones. The obi was one of the first things made, so unfortunately the way the trim was ended is much different than how the rest of the outfit is done due to a change in sewing style. I wish I hadn’t done this, but I digress. The blouse, as much difficulty as this outfit was, was probably the hardest thing to do. The top was a traditional kimono-like top, making that part fairly easy. However the sleeves are in 3 parts: The bell sleeve top, the kimono-like drape, and the standard bottom sleeve. I first made the standard bottom sleeve and trimmed the edge, then had to design a special pattern for the kimono-drape. Each drape consists of the white base, brocade edge, pink lining, and gold trim. Once that was attached to the standard sleeve, I then added the bell top, attaching all of that to the blouse itself. The ball was the last thing that needed to be done. I started off by making the tassel. I took the pink rope trim that I had used on the headdress and tore it apart, ironing it all out and hot gluing it to a bead, then wrapped the bead with a string to make the head. After that, I made the loop top and attached a bead and bell on top to bring the entire piece together. Then I got a little bouncy ball from Wal-Mart and paper mache the crap out of it. I wanted it to be sturdy. Once the design was cut out of it I painted it gold, attached the tassel, and then slipped the feather inside. Tsubasa Li/ Syaoran Li – When it came to this pair of outfits, I felt like I was adding something that was missing to the picture. Tsubasa Li is the mirror opposite of Syaoran Li with a few minor differences (such as Tsubasa Li’s eye patch). With that in mind, I decided that since Syaoran Li was in the picture and Tsubasa Li was not, I would invert the colors on Syaoran Li’s outfit to make Tsubasa Li. I did, however, keep the accent colors correct as I felt that was what was going to connect the two together. I made the arm-sleeves by pattering out the satin and lining so that the contact between the skin and satin were minimal. Once it was sewn together and lined correctly, I went ahead and attached the bottom sakura with heat ‘n bond before trimming the top and bottom of the sleeves with a golden crepe. I then used my now standard ribbon and rhinestones to add details to both sleeves. 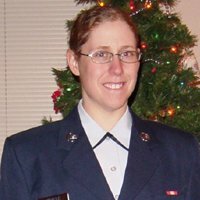 For the head sash, I cut out a long strip of satin (between 3 to 4 yards), sewed it together then flattened it and edged the sides. Unlike Kurogane or Sakura, there was no trim to be had, so when I heat n’ bonded the Sakura down at the bottom, I really had to make sure that it would fit without going over the edges. Like what I did with Sakura, each Sakura on Li has a large middle rhinestone and between 5 to 7 rhinestones on each ribbon ‘stem’. The reason I went with one sakura on the head band was that in the art, there is only one visible (down under Fai’s leg) and I didn’t want to overdo it with two and so many rhinestones. Tsubasa Li, however, had an eye patch, so following the same steps I had to determine where the middle of the head sash was going to be and added the eye patch. I added a sakura to that, since I wanted just a little extra flair for Tsubasa Li. The belts are made much like Fai’s and Kurogane’s obi’s; strips of satin sewn together, pulled right-side out, then hooked together at the waist by a set of 3 hook-and-eye’s. The original picture shows their belts having a large gold buckle, however I decided to go with the obi look simply because the outfit is supposed to look a bit traditional, and given the setting the obi would have worked much better than the belt. After the belts were made, I used heat ‘n bond to put the sakura on, then added the ribbon and rhinestones with hot glue. The Bo was by far one of the most entertaining things to make, considering I was making two giant sticks to whap people with. The end caps were made out of sculpty clay, rounded and made specifically to fit the ends. While that was baking, I drilled a hole in the middle of both ends of the dowel rods, using a special screw to attach them. My intention was to make it to where they could come off for easy transport, but they were too wobbly, so I simply glued them together then used a ribbon to not only hide the seams but to reinforce a bit. Once the Bo was painted red, I made the tassels. The tassels were made by taking a pink rope trim and tearing it apart, ironing out the strings and hot gluing it to a bead. I wrapped the string with a ribbon, making the head. I then used the same rope trim to make ‘butterfly’ loops and the top loop, binding all of that together with a rhinestone. I then attached the tassels to the Bo and added the top end cap. Fai D. Florite – The head rope is a simple blue trim that I sewed and attached a pink bead and bell to the end. The gloves were simple as well. All I did was trace my model’s hand then slowly sewed the outline, quadruple stitching at the top so that the seams wouldn’t split. Once that was finished, I started work on the kimono. 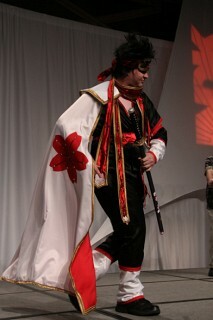 The kimono itself was a bit of a pain. The base of it was simple and was meant to be baggy around the waist; however the sleeves proved to the hardest. Most of the references I saw were that they went with a traditional kimono sleeves. I however, decided against this, instead making it form fitting before transitioning into the sleeves. The whole thing was lined in a blue crepe and trimmed with blue brocade. 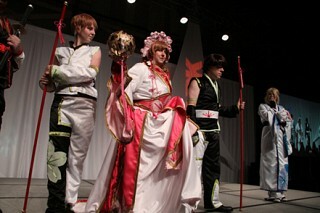 The sakura were attached using heat ‘n bond and the ribbon and rhinestones were hot glued on. Because of the satin and the brocade slipping and sliding against each other, I added a hook-and-eye around the waist to keep the kimono close. The obi was simply made by cutting six strips of the blue brocade and sewing them together, then pulling them inside-out and sewing the edges to make it lay flat. The gloves, on the other hand, took me at least eight tries to make and attempted it with probably six different kinds of fabric. All I did was trace my hand on some stretch material and used another long stretch of fabric to attach them together. I have no idea why I had such a problem with these, but I did. The pants were a simple pants pattern that I have now memorized. The satin was lined with muslin so that the satin wouldn’t rub raw on the person’s skin. At the bottom I added two strips of blue brocade, and then sewed on the buttons. The very bottom was a simple strip of black satin designed so that not only would the strap go under the boot and hook closed, but could easily be pulled off in case the boots needed to come off quick. The belt and hip holster were made with satin, hooking on the side with a hook and eye. The holster itself was made with interfacing and sewn together to match the gun. The little gun happened to have been a toy gun from the dollar store that clicked. I spray painted it gold, added the touches, then secured it into the holster itself. I didn’t want to have staff or con goers trying to grab the gun, despite it being fake. The blue gun was made with dowel rods and cardboard, secured together with hot glue and masking tape, ironically. Kurogane – For the headband, I started off with a thick interfacing, sewing the black satin onto it on both sides. After that, I heat n’ bonded the sakura to the front, and then added the gold trim. I then added the rhinestones to the sides and to the sakura, using jewelry posts as stems rather than ribbon this time around. After that, I attached brocade to the ends for the ties, making sure the brocade was hemmed so it wouldn’t fray. The obi itself is simply brocade cut into 3 lengths and then flipped and hemmed as to not fray. The top was designed as a traditional kimono top trimmed around the neck with a red brocade. The only difference is that it was sleeveless on one side and had this intricate sleeve on the other. The sleeve was made in 3 parts: top, middle, and bottom, all lined with cotton and muslin for the wearer’s comfort. Buttons were sewn on the bottom for accent. The pants, again, were fairly easy. Lined with cotton, the only details I had to add were the bottom white “leg warmers”. Those were simply attached to the bottom, elongated so that they bunched up at the shoe. The arm warmer was made out of a black knit instead of a black satin. I wanted to avoid installing a zipper into this, as zippers are not really a part of this outfit. It was measured out, hemmed, and then sewn together. I picked the black knit not only to avoid installing a zipper, but to give it a matte look and have it stretch so that there was no need for anything other than the material to hold it up. The obi was simply a ton of brocade strips cut apart and sewn together to make a long double-sided obi. The only difference is that I decided to go the more traditional route rather than what the picture shows. Reason being is that a loose obi (like in the picture) wouldn’t be able to hold the shirt closed, and I didn’t want to design Kurogane’s shirt to look like Li’s. The neck sash was probably one of the easiest things I did. I took four long pieces of brocade and attached them together, making sure red was on both sides before I added two sakura to the ends, using rhinestones and jewelry wire to make the stems. I then trimmed the entire thing in gold crepe. The cape itself came in three parts: the cape, the collar, and the sash. The main cape was fairly easy. It’s simply two yards of red crepe for lining and white satin for the outside, each sakura heat n’ bonded on with the ribbon and rhinestones glued on, then the entire cape trimmed in gold crepe. The collar was the hardest part. It uses a semi-thick interfacing inside a double satin pouch. Once that was attached to the cape, it was trimmed with the same gold crepe as the cape. I used a red rope trim to attach the cape to the person, and then hid the rope trim with a smaller sash made the exact same way as the neck sash. 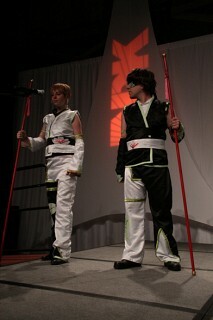 Kurogane’s katana was probably one of the most frustrating things I’ve ever done. Every little thing I did, something huge would get messed up. With that said, it started off as a simple wooden katana. I spray painted the blade silver and added the black accent while the handle was painted an ivory acrylic. Once everything was enameled, I took a long strip of black satin that I had embroidered with a leaf stitch and did what I call a ‘katana wrap’ around the handle. The cap and fuchi are made of clay, painted and enameled to make it look like metal. The sheath itself was pained an off black, 9 different sakura painted on for decoration (pink, white, and crimson red) and enameled to give it a shine. I then wrapped and tied a red trim around the top, then added rhinestones to the middle of the sakura to add some shine.